An-Yi: Is this what happens when little men love their swords? Bhäraté: Hey – the same thing happens when big men love their machine guns. 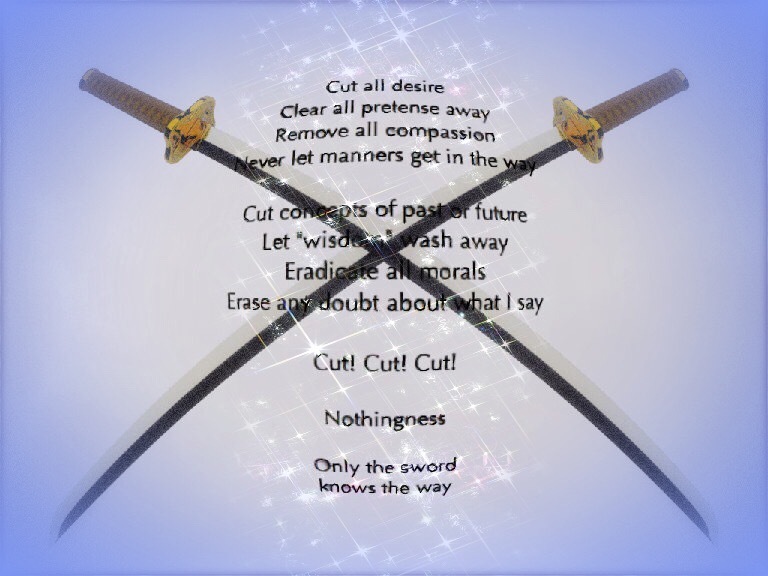 . .
An-Yi: Hasn't there been enough cutting around the world already? When is the time to mend? Bhäraté: There's something ruthless about zen. An-Yi: Indeed. Embracing any dogma or ideology whole-heartedly is a ruthless process. Daiki: To me, zen seems like a way of dying while living – all that it does is negate. Bhäraté: Yes, and then it negates the process of negating. It's utterly absurd. Chariya: And do you think that life is logical?